How can I calculate the bar length in Advance Concrete? Bar length calculation is chosen from the "Preferences" button in the "Advance Project Preferences" toolbar. 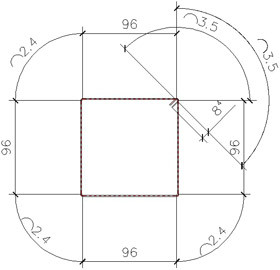 This option calculates the length in the bar axis without considering the bar diameter. Take for example a rectangular bar. 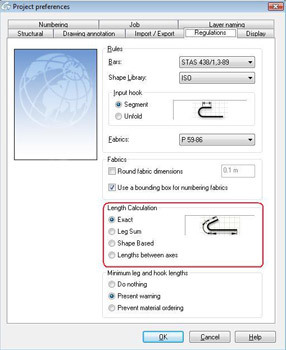 This option calculates the length at the bar outward counting the diameter. 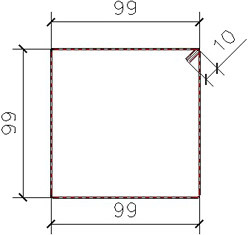 The length of a rectangular bar with diameter ø10 is calculated by summarizing the legs. This option is available only for bars that have a shape code registered in the shape catalog together with a calculation formula. 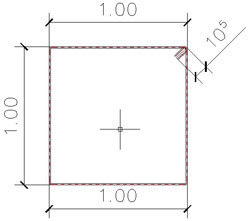 If the bar does not have a shape code, the length is calculated with the first option "exact" (see 1st point). 4. Option "Lengths between axes"
This option calculates the length in the bar axis. Note: The length of the bar, calculated in the 4 ways, will be consider in the bar list.